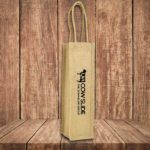 If you like to personally deliver your wine or the equivalent of to your customers, or present it to staff ahead of the holidays, then why not make it easier with the Bordeaux Wine Jute Bag? The branded bag will help to package your bottle up in an effective way; it will show you have thought about your gift and how you would like to present it. The bag can also be kept and re-used, ensuring further impressions of your brand, as the bag is carried around. Branded wine coolers are perfect for a corporate party or dinner. Placed around the table they will generate numerous impressions, helping to reinforce for your brand. Alternatively the wine cooler can be sent to an individual for them to use at their own party. Not only will the cooler get your brand seen by others, your brand could become a part of the dinner table conversation. Whether it's a bottle of wine or a bottle of fizz, this set will have the recipient covered. 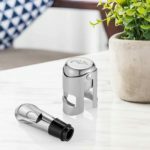 The stainless steel wine pourer will allow the wine to flow, while the Champagne stopper will ensure the party won't loose it's fizz. 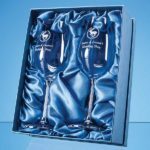 Presented in a luxury gift box, these wine accessories will be kept by the recipient and used time and time again, ensuring your brand will be a part of any occasion, for years to come. This wine set provides a simple and elegant way to present your bottle of wine. 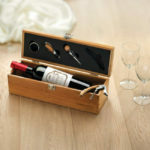 The bamboo box includes four accessories, a wine pourer, stopper, corkscrew and drop collector. Adding your logo to the Bamboo Box will create an impressive set, positioning your gift of wine above the others. These glasses can add some sparkle to your gift of wine, or act as a standalone gift. Boasting diamante filled stems these glasses also have a large engraving area, allowing you to add your logo and/or message. The wine glasses will be a welcomed gift and one that will be at the centre of many an occasion, becoming a treasured gift for years to come. Other glass styles are available, depending on your choice of tipple. We can supply a range of glasses, from champagne flutes to a pint tankard! If our selection of wine accessories has got you thinking about how you can add value to your Christmas offering, call us on 01623 636602, or contact us via email or LiveChat, and our team will be able to help. We also have a range of promotional bar and party accessories should your brand being looking to hit the party season in style! Be a part of the festive celebrations! As we head into December, celebrations and the distribution of gifts comes to the forefront. Wine and fizz are one of the most favoured and affordable gifts to give to customers, clients and employees throughout the festive season and is something the recipient can enjoy and share at their leisure. As a popular choice of gift sent and received by many, we've put together some ideas on how you can add value to your gift, as well as making it stand out. 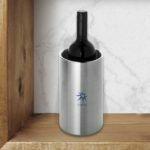 Here's some hand-picked wine accessories that will help your brand be a part of the celebrations, and beyond!